A fully double pink flowered hybrid with typical foliage. 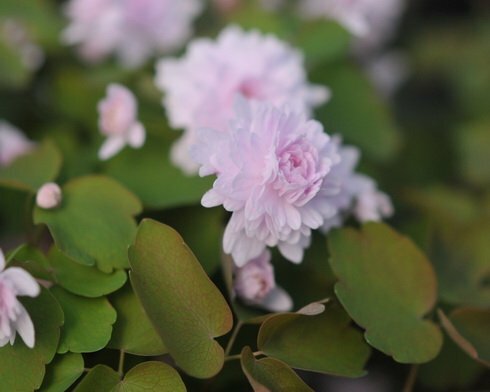 A new hybrid which produces Thalictrum-like leaves numbering up to 9 per stem. Leaf petioles arise directly from the tubers which lie just below the soil surface. Leaflets are rounded, slightly serrated and deep green in colour. Flowers are pom-pom-like, somewhat delicate in appearance but resilient enough to last for several weeks, even in poor weather. Colour is a palest pink and each is fully double. Each stem may carry up to 4 flowers which tend to open in quick succession. Best suited to a shadier area of the rock garden or a woodland situation. Young tubers are supplied. Please note that these plants do not produce large tubers but plants supplied will be flowering size. Similar to Shiozaki but much paler than Oscar Schoaff.